Can I Play EuroMillions Online? Read 2 Reviews! Days of Draw: Tues., Fri.
EuroMillions Exposed — Can You Buy Tickets Abroad? We’re about to get out the big guns. It doesn’t get any bigger in Europe than the EuroMillions lottery. If you’re a lottery enthusiast, you’ve undoubtedly heard about this pan-European lottery, and you’re wondering about an opportunity to play EuroMillions online. This guide is about to answer every single question you’ve ever asked, including “can I play EuroMillions online.” Let’s get started. For a chance to win the EuroMillions jackpot, players choose 5 numbers from 1 to 50 and then select what they call Lucky Stars from 1 to 12. To win the big jackpot, all five numbers plus the two Lucky Stars have to be matched. It sounds like a long shot, but there have been enough big jackpot winners to prove it can happen. Every Tuesday and Friday, EuroMillions is drawn in Paris at 9:45 pm local time. There is NO (!) EuroMillions official website, each country participant has its site and set of games, including EuroMillions. EuroMillions is a pan-European lottery and probably the most significant things to happen on the Old Continent. Currently, it’s being played in 11 countries. Originally, EuroMillions was launched by lottery operators in Spain, Britain, and France. Later on, other European countries decided to join in the fun. Today, EuroMillions is one of the most spectacular lotteries out there, and it attracts players from all parts of the world. You can play EuroMillions online (yay! ), regardless of your location. More information about this option and how to use it will be coming later on. There are 13 tiers of EuroMillions prizes. The game features a cumulative jackpot that keeps on growing. A few years back, EuroMillions organizers decided to cap it at €190 million. This amount rolls over for two jackpots, and then if it hasn’t been won two things can happen. EuroMillions will either add it to the next prize tier or a super draw will occur. As you can see in the table below, the odds of hitting the jackpot aren’t that impressive. Your chance of having all of the required numbers correct is 1 in 139,838,160. The amazing EuroMillions jackpots justify the attempt, and we’ll get to those in a minute. Getting 5 numbers and 1 lucky star correct come with odds of 1 in 6,991,908. Needless to say, as we go down the lower prize tiers, the odds of getting the respective numerical combination correct increase. The overall odds of winning any of the EuroMillions prizes are 1 in 13, which is quite impressive in comparison to what some other international lotteries have to offer. Apart from the regular prizes and regular draws, there are a couple of additional exciting opportunities to keep in mind. EuroMillions is known for its special draws that increase the jackpot size significantly. These special events are known as Super Draws. In these instances, the jackpot begins at 130 million euro! The official EuroMillions website makes announcements about such upcoming drawings – needless to say many people are keeping a watchful eye on those. Since 2016, EuroMillions has introduced a couple of innovations that affect the manner in which players can win. For a start, a new special European Millionaire Maker event has been announced. This raffle-style game is played in all of the participating EuroMillions countries. Winners are selected on a random basis from all of the submitted tickets. Winning codes are chosen at random, giving players a chance to win an additional million. Another important change that took place in 2016 is the size of the minimum guaranteed jackpot. Previously, it was set at 15 million euro. The new rules raise the amount to 17 million euro. While ticket prices have increased slightly, as well, the higher guaranteed jackpot justifies the extra expenditure. What Will You Get with EuroMillions? That is another thing that makes EuroMillions different from many other lotteries. EuroMillions does not offer annuities but pays out the big jackpot in the form of a lump sum. When it comes to taxation, however, the answer will depend on the place from where the ticket has been purchased. Prizes are tax-free in all but three of the European countries that participate in the lottery. In Spain, there’s a 20 percent income tax on prices that exceed 2,500 euro. In Portugal, the tax is also 20 percent, but it applies to prizes that exceed 5,000 euro. Finally, Switzerland collects a tax that’s approximately 35 percent of the sum that was won (yikes!). The period during which prizes have to be claimed will also vary from country to country. In Austria, people have only 28 days from the date of the drawing to collect their prizes. In France, Monaco, and Luxembourg, the period is 60 days. You may want to check the official EuroMillions website to get more information about the regulations and collecting your money. If you’re an international player, you’ll need to understand the local taxation of the country where the ticket has been purchased from and the rules in your own country. Otherwise, you may end up paying double taxes. The online lottery agent you choose can also have some fees. The lesson here is that you have to check all of those legalities before you start playing. If you don’t, a large portion of your money can end up in somebody else’s pocket. Who Gets to Play EuroMillions? EuroMillions is open to anyone to play depending on the country they are in. For Europeans, it is easy as they can either purchase their lottery ticket at the corner store. The rest of us have to play through a trusted online lottery provider. How about a Chance to Play EuroMillions Online? If the national organization responsible for EuroMillions in the respective country has made such an option available, players can buy EuroMillions tickets online. Additionally, it’s possible to play EuroMillions online through an online lottery agent. These are websites that have local representatives in countries where lotteries are organized. The agents are responsible for buying tickets on behalf of their clients. This way, you can play EuroMillions online from just about every spot of the world, even the locations that are most remote from Europe. It’s such a popular lottery, and there’s a ton of interesting information about EuroMillions. Here are some of the most curious facts and stats. Adrian and Gillian Bayford from the UK were the first couple to win the mouth-watering jackpot of 190 million euro. Their lucky ticket won the August 10, 2012 drawing and the numbers that the couple had chosen, included 11, 17, 21, 48 and 50 plus lucky stars 9 and 10. On October 24, 2014, a Portuguese ticket holder replicated the success of the Bayfords. That winner, however, chose to remain anonymous. Apart from the main event, there are a couple of additional opportunities to win EuroMillions money. These opportunities are known as Millionaire Raffle and EuroMillions Plus. Millionaire Raffle is available in the UK. Thus, people living in the kingdom get to benefit from two lotteries with each ticket that they purchase. EuroMillions Plus is an additional game, and its price isn’t included in the cost of the ticket like the one of Millionaire Raffle is. A couple of other quick facts: the minimum guaranteed jackpot per drawing is 15 million euro. The guaranteed minimum jackpot for the Super Draw is 100 million euro. The luckiest country when it comes to EuroMillions jackpot winners is France. Till the present day, 67 tickets bought in the country have won a jackpot. 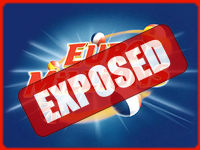 Buried in very, very small print at the bottom of EuroMillion’s home page is a link called ‘Scams’. As in all well established lotteries with an excellent reputation, their name is bantered about and used by various scam artists who send communications (now usually in the form of emails, but can include the telephone, texts and snail mail) announcing a person has won the jackpot, and they are there to help facilitate their winnings. EuroMillions scams range from getting ‘fees’ or ‘taxes’ before payment of the jackpot to personal details that end up in identify theft. The big thing to remember is if you haven’t played, you certainly are not going to win. And if you have played, this is not going to be the way they get in touch. If you are using one of the concierge services to play EuroMillions, that service will get in touch with you. They will not ask you for payment details through any mechanism but advise you, you have won, and get you to go online to process how you are going to receive your winnings! Would you mind rating EuroMillions? This is a great game, and I do like the odds especially the fact that if the big jackpot is capped, the secondary prize starts to look more and more like the jackpot. The sheer size of the jackpot is going to attract a lot of people, which will mean it grows even faster. Just make sure you thoroughly check out any online lottery provider you plan to use or just use one of our trusted ones. You can only win if you play! How Much Does It Cost to Play EuroMillions Online? The only thing I don’t like about EuroMillions is ticket price. It could be lower, but, okay, it’s the biggest lottery after Powerball in US. The ting I like most is the tax free moment. EuroMillions reminds me of Mega Millions or Powerball. The jackpot isn’t so high, but bigger than the most lotteries offer. The taxes are high as well, but it’s better to pay the taxes and still have something than to win a small prize in other lottery. Could you post the taxing of Euromillions in your home country? We, as well as spanish folks are being stolen an obscene 20% in taxes. This must end!!!! It’s Nick here. Firstly, I am definitely not a mathematician. I actually hated math at school. But I do have a friends that are into it so decided to ask them. You’re right! It’s not mathematically calculable odds but probability. There is theoretically the same chance that the same numbers could come up two draws in a row, though it probably would not happen. This math friend said that the odds posted do make sense, but I couldn’t grasp the explanation. It was all kinds of x and y factors that got me even more confused. Re your what Camelot takes, check out our trusted online lottery providers. I get what you’re saying re exchange rates and totally agree. It’s an issue that needs to be carefully looked at. I’ve put it on our list of things for our team to look at overall. Canada’s 649 didn’t look as attractive years ago when the US dollar was so strong. That goes for Oz Powerball. It is also important to understand how a lottery provider processes your winnings to make sure you really do get your money. Give us a bit of time and we’ll get back to you. I would really like to look at this.I’ll also talk to Robert about Euromillions (in particular) and where is the best place to play re what the win is in and what the provider pays it in! Thanks for your feedback! And keep in touch especially if you can tell us about your wins! 20 billion 549 million 347 thousand 200 to 1.
not sure where you got the odds at 116million to 1 of winning, probably off the UK lottery website. The draw takes place in Paris and the winnings is calculated in Euro’s, any one in the participating countries (outside the UK) can buy tickets outside of their home country & still get paid out if they win, the UK Lottery will only let you play and collect if you are resident in the UK and buy the ticket in the UK. the exchange rate for Euro to GB Pounds varies between 1.16 and 1.20 to the pound, When you have a win of any amount Camelot charge an exchange rate of 1.50 to the pound and make an extra 30 to 34 cents on every pound exchanged effectively taking about 20% to 25% of your winning as an exchange rate, check the conversion on any of the winning amounts on any draw on their website. I bet that people won’t feel so luck now after the true figures are exposed, but if you’re not in it you cant win it! Re 1: Your calculation would (almost) be correct, had the order of the winning numbers had any importance. But as it is irrelevant (1,2,3,4,5 gives the same result as 5,4,3,2,1), the correct formula is 50x49x48x47x46/1/2/3/4/5 x 11×10/1/2 which does result in 116 million.